I know it’s been a while, and I wasn’t planning on posting anything here until next week when I start working again after a long (and well needed!) vacation. 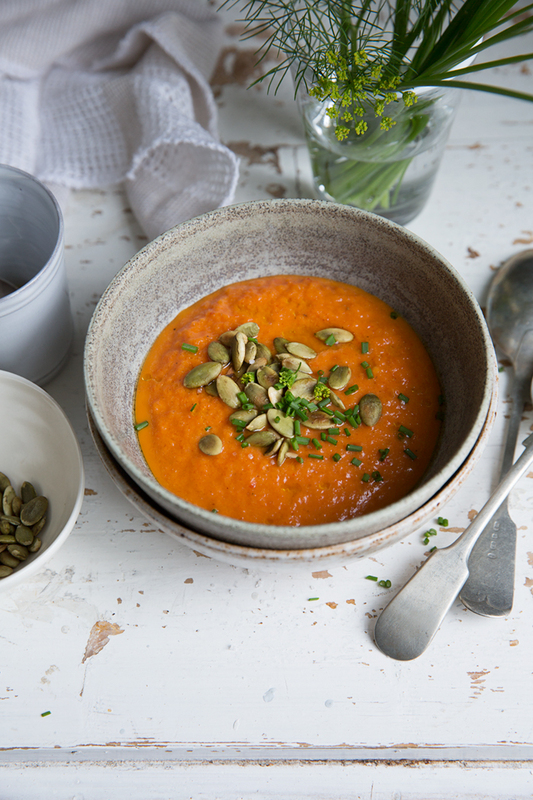 But since I posted this soup on Instagram the other day I have had so many DM:s and emails asking for the recipe so I thought I’d just pop by to say hello and post it here. I make mine as simple as possible. With few ingredients and very few steps. 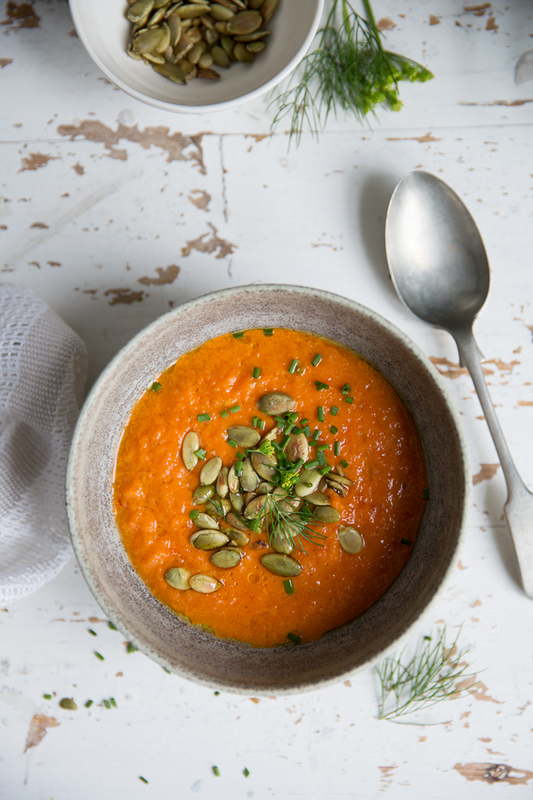 The only effort you have to make really is to roast the peppers (and roasting is the magic that lends all the great flavor to this soup), blend all ingredients well and chill! Just the kind of food I love on a warm summer day. And whenever I have a batch in the fridge, I even drink it as a post workout smoothie. Do I have to mention it is healthy too? Enjoy! 1) Preheat the oven to 240° C (460° F) using the grill function. Rinse, wipe and cut your peppers into quarters (seeds removed). Arrange the peppers skin up, in a single layer on parchment paper on a rimmed baking sheet and roast on the upper rack until blackened. This takes about 5-7 minutes – watch carefully! 2) Once the peppers are deeply blackened, remove them from the oven and use kitchen tongs to transfer the peppers to a bowl and cover with a plate (or similar). Let the peppers steam for at least 10 minutes. Remove the cover and let them cool. Use your fingers to peel off the charred top layer of skin and discard. 3) Place the peeled peppers and all other ingredients in a blender and whizz until completely smooth. Add salt and pepper to taste. You may want to add more chili if you like it peppery! 4) Transfer to a large bottle or jug and chill for at least 3 hours before serving. 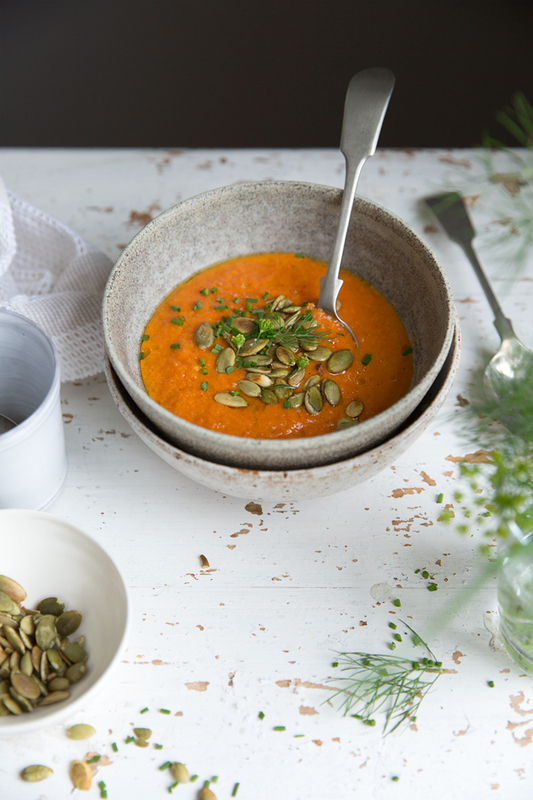 5) Serve with toasted pepitas, sunflower seeds or hemp seeds and fresh herbs. Dill and chives work very well and basil is great too. A drizzle of olive oil won’t hurt either.